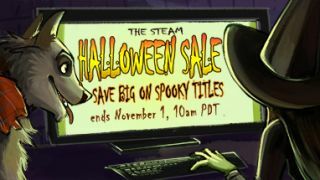 Valve has finally pulled the proverbial coffin lid back on its annual Steam Halloween Sale, unleashing amazing deals on a huge collection of horror games and movies. From big AAA games to indie gems, expect to save up to 80% on the best scary games of recent memory. The sale went live just minutes ago at the time of writing, and will go on through Halloween to 10am PT, 1pm ET or 6pm BST on November 1 – or 5am AET on November 2. Doom, arguably one of the best shooters of 2016 (and chock-full of demonic jump scares), is available for a cool 33% off right now. Pick it up now for the lowest price it’ll likely be on PC for the rest of the year. Resident Evil 7, the revival of the franchise that everyone had been waiting for and launched early this year, is now a whopping 50% off on Steam. Grab this modern gem before it's full – and we mean absolutely full – price again. Alien: Isolation, indisputably the most tonally accurate game to use the storied license and just downright horrifying, is a massive 70% off right now. Swipe this one up for a relative pittance before it reverts to its already-reasonable asking price. The Amnesia Collection, a series of games from indie developer Frictional Games that arguably jumpstarted the horror game renaissance, can be had for an enormous 90% off during this sale. If you consider yourself a horror game fan, then this is a must-have deal, full stop. This bundle of all the Friday Night at Freddie’s games will catch you up with the indie craze right quick, and make you jump out of your seat way more than once. Grab this collection of scary games for a giant 80% off before it's too late.